Isn't managing a system the same as goal setting? Insurance Agency Development. 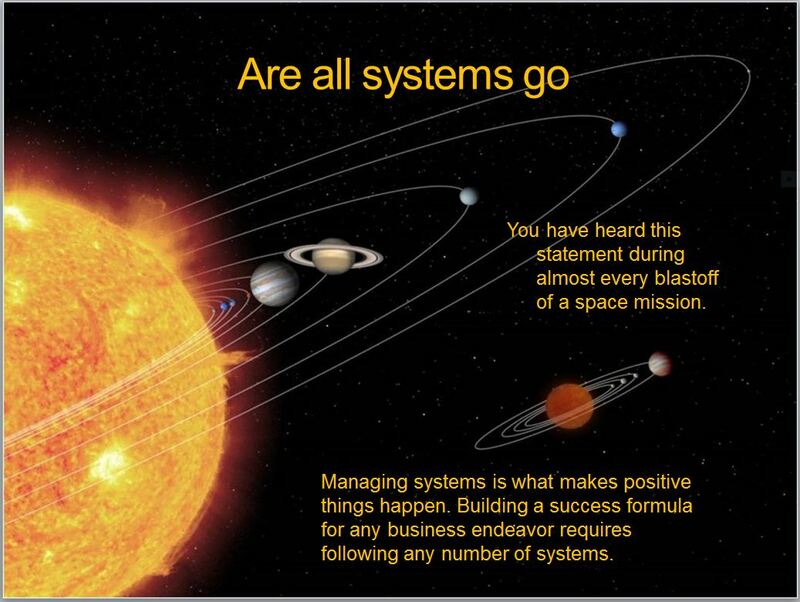 Many people have asked me "what does it mean when someone says they are managing a system. Isn't that the same as setting goals?" The simple answer is No, it is not the same as setting goals. A system is a systematic series of steps and deadlines to achieve goals. A system removes all the emotional baggage when dealing with people. To be a truly successful insurance agency manager or a successful personal insurance producer, or for that matter, successful in any endeavor that you may take on, you must first have a business plan , then you need to develop and manage systems to accomplish your intended plan of action. Success does not happen by accident. Managing a system will achieve the desired positive results you want to achieve, or show you negative results that will help you remove future problems. Part 2 explains this in more detail. Developing a System requires you to become 2 people. One is your boss and the other is you, the employee. Whether you are an agency manager or a personal producer. so first of all you must put on your boss's hat. as your boss, you will need to sit down and build a plan, (system) for your employee (you) to follow. Then as boss, you will need to review and monitor your employee's results on a daily basis. This is the concept I used for myself. However, it will require a behavior management change to almost everyone. In this business, you are now your own boss. Description > A successful insurance agency development manager and recruiter usually knows the difference between managing a system d and managing people. When you manage a system, you remove the emotional factor of dealing with people. When managing people you are dealing with all kinds of emotions and excuses. Those emotions and excuses are goal killers and energy takers. I know that for a new person or a new agency manager just coming into the insurance business, this may be hard to comprehend. But it is reality. When you are managing a system, you are managing a step by step process to reach an end result. That end result being a specific goal. Managing a system has specific time lines, deadlines and creates a sense of urgency. A good system is like an automatic pilot. Once you initiate the autopilot, every step of the system has to be followed exactly. You repeat a success formula. An example of this, is the system I used when I was recruiting new agents. Here is a simple analogy. When you get up every day, believe it or not you go through a system, a checklist of sorts. You may start out with a cup of coffee or orange juice, take a shower, brush your teeth, shave, comb you hair, put makeup on, get dressed, look in the mirror, then head to work. But let’s say you missed doing one of those items in your daily wake up system. Your end result may not be achieved. You might stink or look un-groomed. In other words the end result is impacted in a negative way if you missed following one of the steps in your morning wake up system. How do I manage the people if I am managing a system? You manage people by creating a positive environment, cheering on people, developing a win-win situation, positive reinforcement, showing them how to correct mistakes, etc. Those are managing the people skills. Don’t confuse this with managing a system. Managing a system is the creation of a series of steps and rules that are needed to accomplish a goal. Once created, you then use those steps and rules to achieve your goals. Most people confuse managing a system with goal setting. There is a big difference. As an example; if your goal is to make 3 sales a week. · Need 10 more starting at 5:30 each evening before my first evening appointment. · Must get 12 referred leads by Friday of every week. · Plus any other system requirements. If you do not follow the system requirements, then there is a good chance your ultimate goal will not be achieved, unless you get a lucky break. But luck has its limitations. How does one create a insurance agency development system? Usually a system can be created from past experiences, an accumulation of past data, via your manager or mentor. Then you continue to fine tune it for maximum efficiency. As a general rule, those people that can sit down and develop a detailed insurance agency development system, and lay out a step by step procedure, and then implement those steps, are usually the most successful. This is the first step of creating a success formula. A success formula is something that you do over and over to achieve certain results. An example of a success system is McDonald's, Kentucky Fried chicken and Pizza Hut. They started out with a basic system and then kept fine tuning it to get better and better, resulting in making more money. People that do not know how to create a success formula will almost always fail. Insurance Agency Development requires managing a number of systems. Each system I used when I built my 150 person agency is laid out in my agency building manual which consists of 10 separate modules, each one being a complete system. Remember, the creation of a good insurance agency development system eliminates many of the headaches that most inexperienced agents and managers have to deal with. Almost all management headaches come from managing people and not the system. A good system is like an automatic pilot. Once you throw the switch, every thing should be automatic. People that don't follow your system should be dismissed. In any insurance sales organization, or for that matter, in any sales organization, we have the managers and we have personal producers (The sales people). Both must learn how to manage systems to become successful. Let’s look at how managing a system impacts a manager and a personal producer. And if you have not stopped by and checked out our Insurance Agent Survival Store you should do so now.